2. Add a link to the person who awarded it to you. 3. 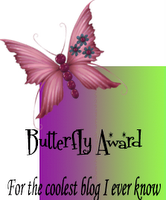 Link 10 other bloggers of whom you want to give this award to. Posted by Is | at 2:17 PM | Labels: About | Estou lendo: Butterfly on a wheel awardTweet this! | Feed. thanks for the award schweetie, i truly appreciate it. i am going to add it to the other one i received today if you don't mind. have a wonderful evening!